I woke up early today at around 6:00 am and got ready for my flight to Quetta. I ate some light breakfast and arrived at the airport well in time. Having nothing to do during the wait for the flight, I listened to some music on my father’s laptop. Near the time of boarding, we came to know that the flight had been delayed. During the wait, I looked at the various aircrafts being serviced and prepared for their next flight. The aircraft (an Airbus) arrived around 11:30 am after which the boarding started at around 11:45 am. The Airplane took off at around 12:15. I enjoyed the head rush during take off. We soon climbed to around 36000ft. It was interesting to see the ground fading away to be replaced by clouds. The flight crew; a man in his late forties, a young man in his twenties, and two female air hostesses served food. I refuse to state any guess at the ages of the female crew for my own safety :) . I listened to some music and read some fan fiction on the laptop intermittently while indulging in watching clouds and the slightly visible ground. The flight took around 75 minutes from take off to landing. Near the arrival time, there was quite a bit of air turbulence due to air pockets created by the combination of mountainous terrain and hot climate. We safely landed at Quetta International Airport. We had bookings at the Serena Hotel which is one amongst the three to four major hotels in the city. There aren’t a lot of such hotels since Quetta is a relatively small city. We took the hotel’s transport from the airport to the hotel. On arrival, I was pleasantly surprised to find that the architecture of the hotel greatly resembled the local construction of forts with soft wall corners and traditional designs. Out of all the hotels I have been to in Islamabad, Karachi, Bhurban and other places, this hotel in Quetta gets a 9/10 for its design alone. There are some fountains at the entrance and the check in was quick and easy with no hassles. The bell hop dropped our luggage at our room. The room itself is nice and comfortable. The interior décor of the room also showed an obvious touch of the local culture. I turned on the TV and browsed through the available channels but they were for the most part, the same ones available at my home in Islamabad. Since it was already quite late in the afternoon, we ordered a pizza through room service which arrived in half an hour. After eating it, I got some much needed rest and woke up around 8:00 pm. We were invited to a buffet dinner in the Jasmine Food Court where I indulged in my all time favorite BBQ food and met up with some other people. I took some pictures, but unluckily, I forgot the USB data cable for the Handycam at home, I won’t be able to upload those pictures anytime soon. I helped my father with setting up the booth for the inauguration ceremony tomorrow morning. We returned to our room by 12:00 am and I started typing up this entry. It’s 12:30 now. I will just post this, read some fan fiction and then go to sleep. Tomorrow will be a brand new day in Quetta! I woke up today at around 7:00 am and got ready for the day. I had some breakfast consisting of sausages and some channa-poori (a local dish). Then around 8:45 am, I proceeded to the previously set up booth and helped my father with it. After that, while my father proceeded to the seminar titled ‘Rural Women and Alternate Energy Workshop’, there was nothing much for me to do so I took some pictures and turned on the laptop with the intent to read some fan fiction. Meanwhile people visited the booth and asked general questions about solar power and its use in various products. These were mostly the hotel staff from places in and around Quetta. Soon, it was time for tea during which my father answered various queries about solar products to seminar attendees. It lasted half an hour after which I was alone again. I went back to reading fan fiction. Just before lunch hour, I realized that the charger for the laptop had a cut in the wire with some smoke rising from the cut. I took it off and made up a temporary connection between the wires. It was soon its usual functional self. Guess I will have to get a new one when I return to Islamabad. Soon after that, I went to have some lunch consisting of pulao (rice) and some chicken pieces. It wasn’t very interesting sitting in a corner except for the people watching I indulged in. Has anyone ever noticed how much women talk when in groups? I certainly did. After returning to the booth, I waited for another hour till the time at which the seminar was scheduled to be over. I went into the seminar hall to take some pictures during the wait. Apart from that, it was me and laptop. In the evening, I got to go to the local bazaar with my father. There was a lot of vehicle smoke which irritated me but apart from that, it was interesting. There were sections in the market; separate area for motorcycle workshops, crockery/utensils, etc. The only shops spread all over the market were fresh fruit shops. I distinctly say ‘fresh’ since there are a lot of dry fruit shops too. Quetta is famous for dry fruit. Around 9:30 pm, we went for dinner and had some ‘sajji’. It was better than what I had previously eaten in Islamabad. We also had some ‘mutton karahi’ which was delicious. There was some talk about the energy sector where I shared some info I learned in a General Electric seminar at my university about GEs windmills and the Evolution locomotive engines. There were also some people from Kandahar, Afghanistan interested in alternate energy. We talked about the situation in Afghanistan and it was interesting to know that Hamid Karzai, the current Afghan prime minister used to sit in a general store (departmental store) in Quetta before he became the Prime Minister of Afghanistan. There was also talk about how he is a mere puppet and is not a man of his own will. The situation in Afghanistan and the lack of services like electricity was also discussed. We came back to the hotel late at night around 11:30 pm. I was quite tired by that time and was soon in bed in a deep sleep. Today I woke up around 9:30 am and made quick work of getting ready for breakfast. Even then, we just made it to breakfast in time. After eating a very filling breakfast, we returned to the room and waited for a person who was to take us around Quetta and then to the Hanna lake. I whiled away the time watching TV. During the wait, I also visited the hotel’s orchards and gardens. It was very beautiful and breathtaking. The peach trees with a soft grass carpet under them presented a very soothing site. Since this is the fruit season, there were ripe peaches and apples in the trees. Nearby, there were some seats and a fountain. The fountain had an ethereal look about it with frothing water having a peculiar white color probably from the stones and bricks used for its construction. Soon the person we were waiting for arrived; we met them in the hotel lobby and got in their four wheel drive vehicle. We traversed the snake like roads to a location where there was a fruit gardener using a tube well with a diesel pump. Apparently, his land had around 600 trees. It was informative knowing how he grew the trees and managed the water from the tube well. After that, we proceeded to Hanna Lake. On first glimpse, it seemed quite similar to the image at the start of this blog entry. We had to leave the jeep in the parking lot. The driver remained there to look after the car. We walked towards the lake. 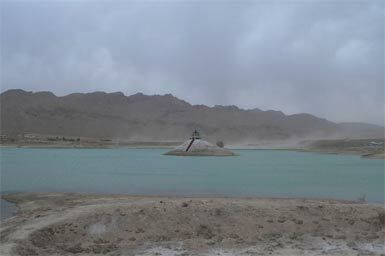 The first thing noticeable was the hut type structure in the center of the lake which seemed to match some small Buddhist or Chinese structure. There is a small park for children with some swings. Nearby, there is a restaurant with large advertisement of Coca Cola on it’s walls. We sat outside the restaurant to get a clear view of the lake. A Pakistan Air Force airplane (F-6 of Chinese origin) was visible on the other side alongside some small structures. The water level was remarkably low when we actually looked at the lake. The realization wasn’t as strong in the pictures. There were two boats available for tourists but we didn’t go out in them since we had to get back in time for Friday prayers. We had some drinks from the restaurant and took some pictures. After that, we took a walk along the boundary path and soon reached a brick structure. 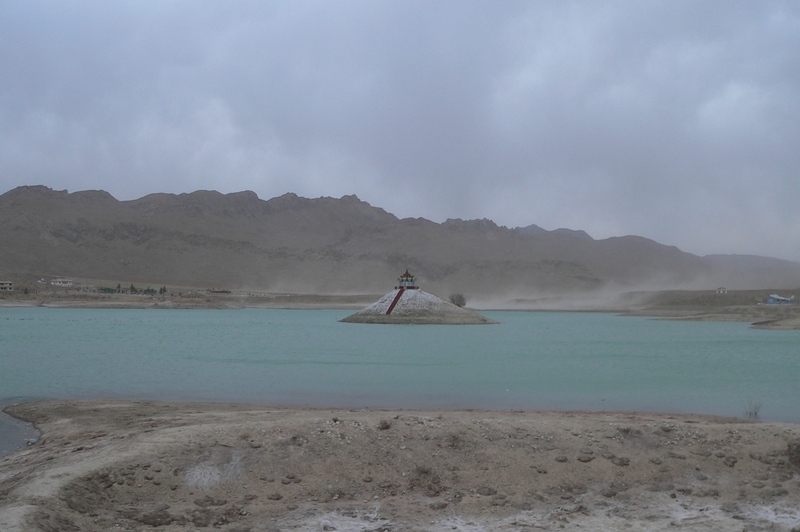 Our guide (well, semi-guide to be more accurate) told us that in the time of the British, Quetta used to get its water supply from this lake. When the water level of the lake got low, the water supply was stopped. We saw the manual mechanism for controlling the flow of water from the lake but most of it was broken from age and there was barbed wire all around it. We turned back near that point. On inquiring about a peculiar round brick structure at some height, the guide explained to us that at one time there was a chair lift there. There was an accident involving a woman and her child when the chair lift collapsed and they plunged down towards the lake. Unfortunately, they fell down near the shore and immediately lost their lives from the injuries. After that, the chair lift was closed and hasn’t been activated since. After that, we walked back towards the jeep thinking over this information. Soon, we were driving back towards the hotel talking about the local people and agriculture, the fruit trees in particular. We had to take some detours since the guards near the Army’s cantonment area denied us entry because our jeep didn’t have the authorization sticker. We made it back to the hotel but unfortunately, were quite late and missed the Friday prayers. After that, I spent the time in the room alternating between watching the TV and reading fan fiction on the laptop. In the evening, some people including two students from some local university came and met my father in our room with various queries about solar power and its possible uses. Soon, they were gone. After that, we got an invitation from the person we met last night for dinner and we had some ‘Mutton Karahi’; a dish with lots of spices and goat meat. We returned late at night and watched some TV before succumbing to sleep. Tomorrow, we will be going back to Islamabad some time in the afternoon. Today again, I woke up and got to breakfast just in time. I guess it is becoming a trend. When I returned, I went to wander the hotel’s gardens and orchards while dragging my father along. It is a beautiful area with a lot of soothing material for the eyes. Since it is summer, the fruit was ready for eating and I tasted a plum. It was very sweet and delicious. I guess the hotel uses the same fruit for their own use since they have it readily available. We took some pictures and enjoyed the silence and calm environment. Birds were chirping around us and it was a very pleasant place to be in. We wandered around the place until we reached the ‘Moon Garden’. It has a small fountain in the center with some shade from trees at the far side. I sat down on the edge of the fountain and dipped my feet in. Even with all the sunlight, the water was quite cold. My clothes did get a bit wet near the ankles but I enjoyed it immensely. Since we had to return o our room soon, we came back to our room through a nearby exit. I dried my feet and turned on the laptop. I whiled away the time on it tilt was time to leave for the airport. Meanwhile, we got ready to leave and packed our luggage. The hotel’s transport came right on time and left the hotel at around 3:00 pm. The hotel bills were already settled and I departed with a heavy heart. I watched the rough terrain on the way to the airport and preferred to keep silent. After going through the security procedures we arrived at the waiting lounge. Our aircraft was visible through the window clearly. It was an Airbus. I spent the one hour waiting time talking to my father about Quetta and the nearby Air Force base visible through the same windows. Soon, the announcement for boarding was aired and we stepped in line. On close inspection, I realized that the aircraft was bigger in size than the one we came to Quetta in. On finding my seat, I came to realize that it was again by the window, as has been usual for every flight I have been in. I dropped into the window seat and patiently waited for the aircraft to start taxiing which took about half an hour. Soon after that, we were in the air watching the Earth disappear in a haze of white fluffy clouds as the aircraft adopted a circular climbing path. I opened up the laptop again to pass the time. Meal was served by the cabin crew while I tried to get glimpses of the land underneath us. In no time at all, the air hostess was announcing that we were about to land at Islamabad International Airport. The landing was smooth. The luggage did take some time to be acquired. I guess that is the problem with boarding the aircraft early. The driver was waiting for us and it was straight to home after that. I did missed Quetta but I missed my home more! There were stories to share about the trip and luggage to unpack which I got to soon after we got home. And that concludes my wonderful, though short, journey to Quetta. I would love to go back some other time when I have plenty of time to explore the city and enjoy the local culture and people. I wish for the people in Quetta to live in peace and prosperity in their wonderful city. Amen! Quetta is a very nice and diverse city. I saw people from all four provinces there. Quetta is very nice and beautifull city of balochistan also capital of Province balochistan which is known for the city of beautifull fruit garden and All seasonal weathers are very beautifull in QUETTA , Also known as city of weathers in Pakistan.